What is another word for hills? 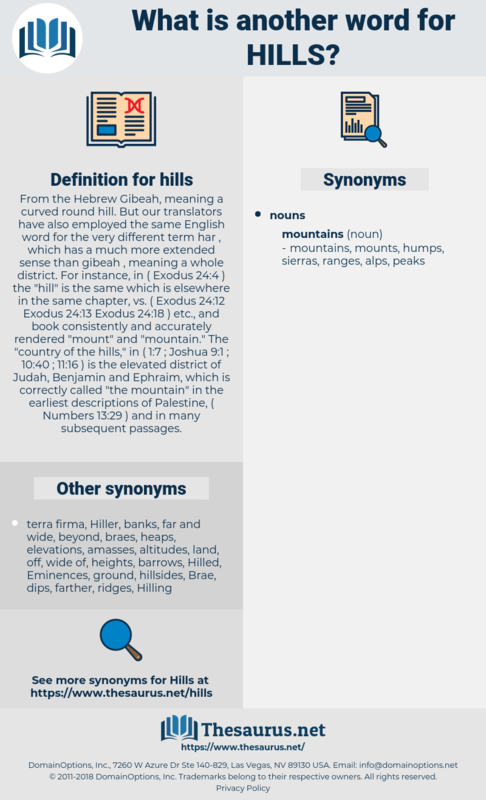 From the Hebrew Gibeah, meaning a curved round hill. But our translators have also employed the same English word for the very different term har , which has a much more extended sense than gibeah , meaning a whole district. 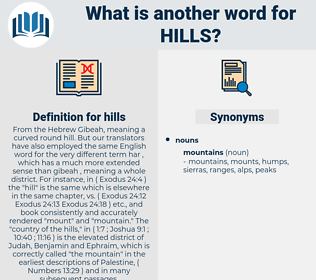 For instance, in ( Exodus 24:4 ) the " hill" is the same which is elsewhere in the same chapter, vs. ( Exodus 24:12 Exodus 24:13 Exodus 24:18 ) etc., and book consistently and accurately rendered " mount" and " mountain." The " country of the hills," in ( 1:7 ; Joshua 9:1 ; 10:40 ; 11:16 ) is the elevated district of Judah, Benjamin and Ephraim, which is correctly called " the mountain" in the earliest descriptions of Palestine, ( Numbers 13:29 ) and in many subsequent passages. hillsides, hilltops, knolls, foothills, hummocks. Philly, philadelphia, district, television, Cordillera, montane, sierra, Bryn, MONTS, range, tv, teevee, t.v., sand, dune, shan. hiils, highs, elevations, woods, sites, shorelines, coastlines, altitudes, Cairns, shores, buildings, Stations, dishes, platters, flats, piles, Aborigines, clearances, uplands, heavens, gradients, poids, rocks, resorts, tiers, Shelves, weight, Weights, havens, mounds, coasts, boards, seamounts, ranges, slants, UPS, ribs, Plants, surges, monks, grades, Trays, pans, decks. So he once more went over the hills to look for him. You ought to have been born in the hills.